-Studies have shown that injury, pain, and degenerative diseases increase with decreased pH levels. 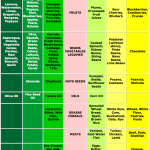 That being said, choose foods that will keep your body more alkaline rather than acidic. -Increase omega 3 fats because they reduce inflammation. -Avoid over using non steroidal anti-inflammatory drugs (aspirin, ibuprofen, etc.) because they can inhibit repairing tissues in your body. -Have your trainer pay close attention to your technique and try to reproduce that action when you are working out on your own. -Warm-up so that your muscle are ready to work. -Cool down to avoid blood pooling and light headedness. -Respect your abilities and orthopaedic status. Progress into more difficult exercises; don’t try too much too soon.